The sisters sent word saying, "Master, the one you love is ill."
As I reflected on this narrative, these words caught my attention: "The one you love is ill." As I recall in the last couple of weeks of my Lenten reflections, John does not use any names in: The Women at the Well, or in The Man Born Blind. However, Lazarus is called: ‘the one you love.' His sisters sent word to Jesus saying, "Master, the one you love is ill and needs healing." John has shared with us about Jesus miracles, of transforming those three lives and the good news is, that any one of us could enter those experiences: asking Jesus, for the water of life and for sight and healing. And this week, we are entering the experience of Lazarus, knowing that each of us can feel we are the one Jesus loves and we need new life. John offers us a story with a miracle (what he calls a sign), and as always with John, it is not to impress. It is for the glory of God, and he is even more explicit in this Gospel - that the Son of God may be glorified through it. So, when Jesus heard that Lazarus was ill, he remained for two days in the place where he was. When I thought about Jesus' decision not to go to Bethany right away, I had mixed feelings. I felt sorry for the sisters, but I could immediately relate to their frustration. Sometimes when I have prayed, my prayers were not answered right away. As I have matured and grown in my Spiritual journey it has occurred to me that what I have prayed for is either not His will or that He is teaching me to be more patient in the situation. Also, sometimes He needs more time to put things and people into place (I call Him my Eleventh-Hour God!). I have asked myself what has comforted me with Lazarus’ experience! The insights have helped me to take advantage of the opportunity to die to my sins and to heal the inner-self through the Sacrament of Confession. The challenge is that when I go to confession, it is like being all wrapped up and bound. Each piece of cloth is binding me and representing my sins, emotional pain, illnesses, worry, anxiety, and anger to name a few and for the healing to begin. We first receive forgiveness from the Lord and absolution from the Priest. However, the freedom begins when we listen to the Lord, for Him to call us by name ____________, like Jesus said, "Lazarus, come out." Then when he was raised from the dead, Jesus asked those standing around him to untie his wrappings. One of Jesus' purposes was for them to witness the miracle of raising Lazarus from the dead. 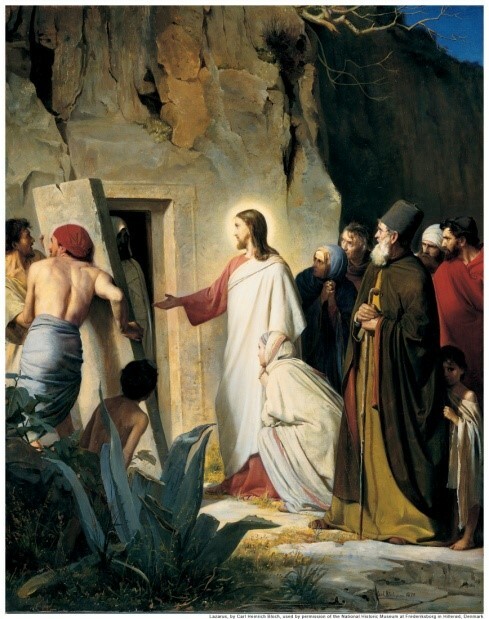 We too can be living witnesses to the healings and miracles in our lives as we hear Jesus call us to come out of our tombs.